1. 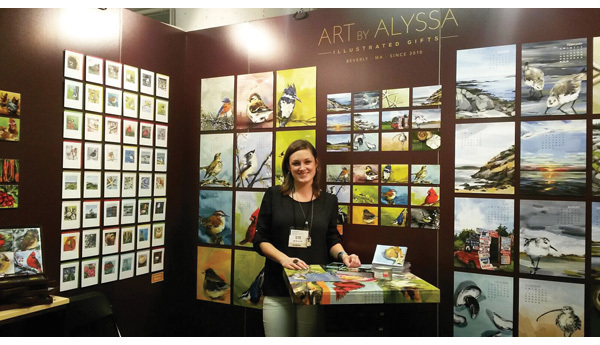 )You just attended the Atlanta Gift Show for the first time. Can you tell us a little bit about your experience? I still haven’t found an easy way to describe what it was like to attend AmericasMart. It was pretty much every possible emotion: excitement, fear, exhaustion, etc. It was so inspiring to see and meet other people like me. Coming across booths of companies that I have known and watched grow since I was a teenager gave me the same feeling as if you walked by someone famous on the street, and then to think, I’m exhibiting at the same show as them?! That was unreal. That was by far the biggest step for my company to date and two months later, it still all feels a little bit like a dream. 2.) Many of your paintings are of birds. Do you have a favorite bird you enjoy painting? Or one you haven't but would like to? I love painting a Hermit Thrush for their long legs, otherwise, any bird that is really fat. They always seem to be cuter. 3.) What was the last art related show that you attended? A solo show of one of my best friends, and fellow business owners, Emily Dumas. I am lucky to live in a place where I can attend many local art openings, and I try my best to see them all. 4.) Name one tool in your studio you could never do without and why. I don’t know how to pick just one! My computer does SO much for me from marketing to editing photos that I take to paint, etc… but who wants to pick a computer for this answer?! Having good paintbrushes is definitely key. I buy cheaper brushes so that I can just go through them and buy new ones more often. Nothing better than a brand new brush. 5.) What or who inspires you? I am most inspired by others who are on the same path as me, as well as friends, and other artists who do work that I could never even dream of being able to do. Over the years, I have acquired a large group of fine artist friends and I feel, as an illustration major, this is the main reason for the growth in my own paintings over the last few years. I have learned how to push my paintings from watching what they are producing and knowing how they are thinking about it. 6.) Many artists have multiple collections. Is there anything you collect? I don’t really collect, but I do hold onto things for WAY too long. I’m a little bit of an organized hoarder. 7.) Most of your work is placed onto various products that you make in your studio. Is there a product you would like to see your work on in the future? Cocktail napkins could be awesome! I’ve also always wanted to do a deck of cards with birds on them. Either playing cards or do something that is like flashcards with the different types of birds. 8.) If you could own one famous painting by any artist, what would it be? I don’t get that excited about famous paintings, I feel like it’s boring because you see them so often and you’re just “supposed to like them.” I’d rather have a painting that is from an up and coming artist that inspires me. 9.) What is the number one place you would choose to go to explore art and culture? Italy, but really spend a lot of time outside of all the “normal cities” you’re supposed to go to. 10.) Tell us about a piece of yours that you are proud of and why. Any painting that I really stay loose with. One of my favorites would be my strawberries. I like how I was able to leave certain areas alone and just tighten spots here and there to bring it together. 11.) What words of advice would you give to an inspiring artist or small business owner who is just beginning their career? Just keep going. You have no idea where it’s going to go when you start out and you might feel like what’s the point because you don’t have actual assignments or shows to be making artwork for, but if you keep making it and putting it out there, things will start to happen. 12.) Name the 3 things you could never live without. Loved ones, delicious food and drinks (my days revolve around my next meal), and the ability to make art. 13.) Do you have any creative rituals before you sit down to start a piece? Not really. I normally just put on some music or a movie/show that I’ve already seen so I don’t need to look at it. 14.) What’s on your Spotify list? I’m still learning how to use Spotify…it’s scary. 15.) When was your "aha!" moment as an artist? When I finally figured out how to loosen up in my paintings. Not bring every tiny section to a perfect tight finish.